Free Shipping Included! 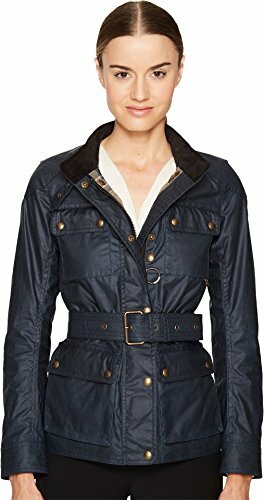 BELSTAFF Women's Roadmaster 2.0 Signature 6 Oz. Wax Cotton Jacket Dark Teal 44 by Belstaff at Toad Lily Press. MPN: 72050297. Hurry! Limited time offer. Offer valid only while supplies last. Belstaff Women's Outerwear and Tops Size Chart Style and functionality meet in the BELSTAFF™ Roadmaster 2.0 Signature 6 oz. Wax Cotton Jacket. Belstaff Women's Outerwear and Tops Size Chart Style and functionality meet in the BELSTAFF™ Roadmaster 2.0 Signature 6 oz. Wax Cotton Jacket. High neckline collar with adjustable buckle closure for desired fit. Hidden zip closure with full front snap placket. Long sleeves with single snap adjustable cuff. Removable, adjustable belt at waist with buckle closure for desired fit and look. Left and right hand pockets with double snap button flap closure. Two front chest pockets with snap button flap closure. Additional left inner pocket with zip closure. MATERIALS: 100% cotton BODY LINING: 100% cottonSLEEVES LINING: 100% viscose Spot clean w/ damp sponge. Imported. This item may ship with an attached security tag. Merchandise returned without the original security tag attached or a damaged tag may not qualify for a refund. Measurements: Length: 25 in Product measurements were taken using size 40. Please note that measurements may vary by size. Style and functionality meet in the BELSTAFF™ Roadmaster 2.0 Signature 6 oz. Wax Cotton Jacket. High neckline collar with adjustable buckle closure for desired fit. Hidden zip closure with full front snap placket. If you have any questions about this product by Belstaff, contact us by completing and submitting the form below. If you are looking for a specif part number, please include it with your message.